The Book of the Psalms does not offer us standard confessions of the divine ecstasies, but theological processings of the ecstatic experiences. 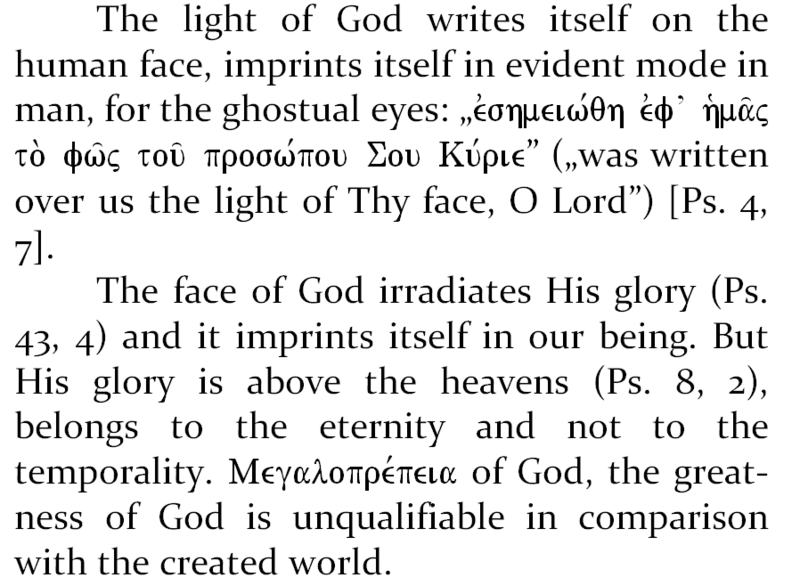 The integer scriptural text is interwoven with experiential remarks, not being at all negligible those relating at the glory and the presence of God in the world. 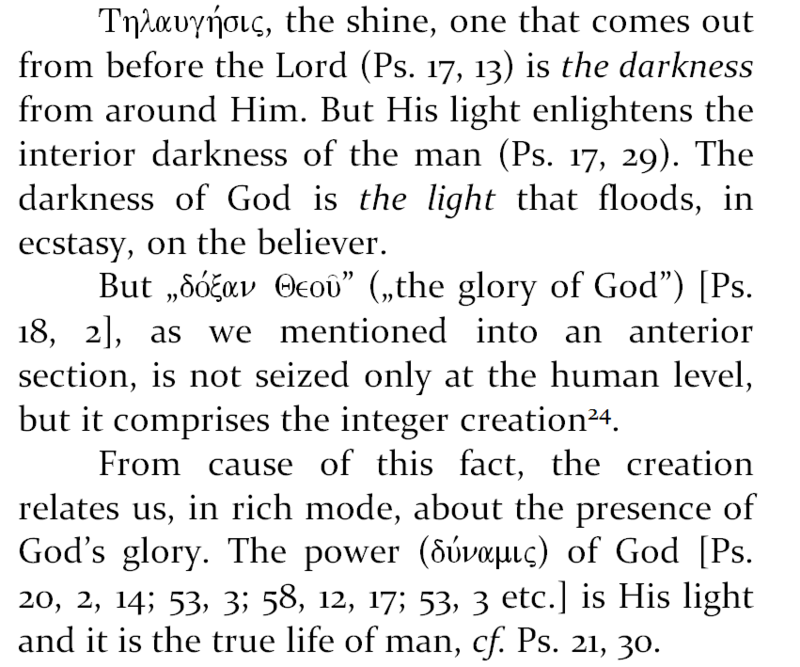 The glory of God is seen by David and by other authors of the Psalms and it is confessed as a reality on which they have appropriated, which belongs to them, but which does not transform in something material in their being, but is the work of God which shines in their being in quotidian mode. The mountain, expression of the divine transcendence, is not an obstacle for to be heard, if you pray to God. God hears on the ones of down, even if He lives into the ones high. 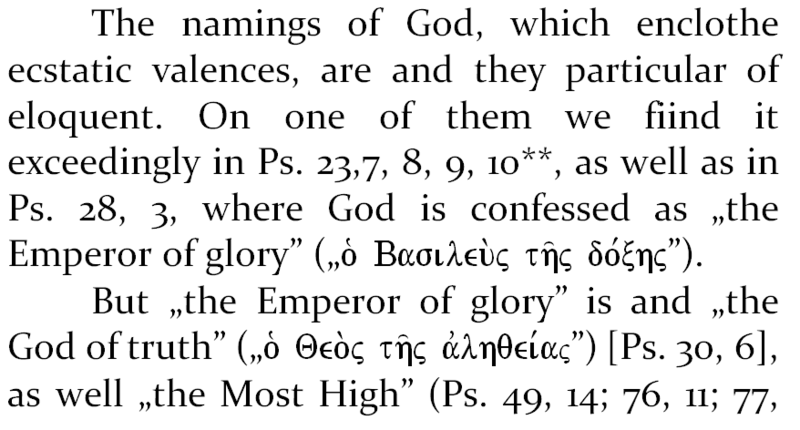 The rarity of this substantive in the LXX (appears of five times in Psalms and of six times in the LXX) indicates the fact that the reality of God exceeds any human denotation. The believer man experiences the presence of God but cannot define it, cannot fully confess it in human terms. The Lord dwells in Zion (Ps. 9, 12; 19, 3; 25, 8; 47, 3; 75, 3 etc) but His holy temple and His throne are in heaven (Ps. 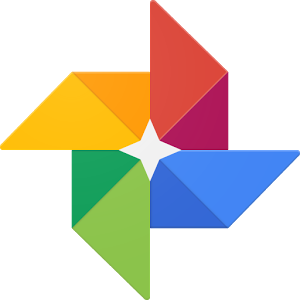 10, 4; 17, 7; 19, 3, 7; 23, 3; 27, 2; 32, 14; 67, 6 etc). The two affirmations are not mutually exclusive. The Lord dwells, through His glory, in the middle of the people of Israel and He enlightens the eyes of men (Ps. 12, 4; 26, 1; 33, 6). Ps. 14, 2-3 and 23, 4-6 show the interior conditions required by the one who wants to dwell in the mountain of God (Ps. 14, 1; 23, 3). Only the Saint will dwell in the holy mountain of God. The climb in His mountain does not presuppose the moral dilettantism and nor the lack of intimacy with God, but the most direct ascesis, to which God answers through the showing of His glory. The sight of God brought him the most intense interior certitude and this made him to pass with well through all the temptations and the troubles of this life. The consequences of his ecstasy are the enjoyment and the blitheness of heart and much hope of salvation (Ps. 15, 9). David’s body is touched by God’s glory and he understands that his body will have part of incorruptibility, of incorruption (Ps. 15, 10), if he was made intimate with God. 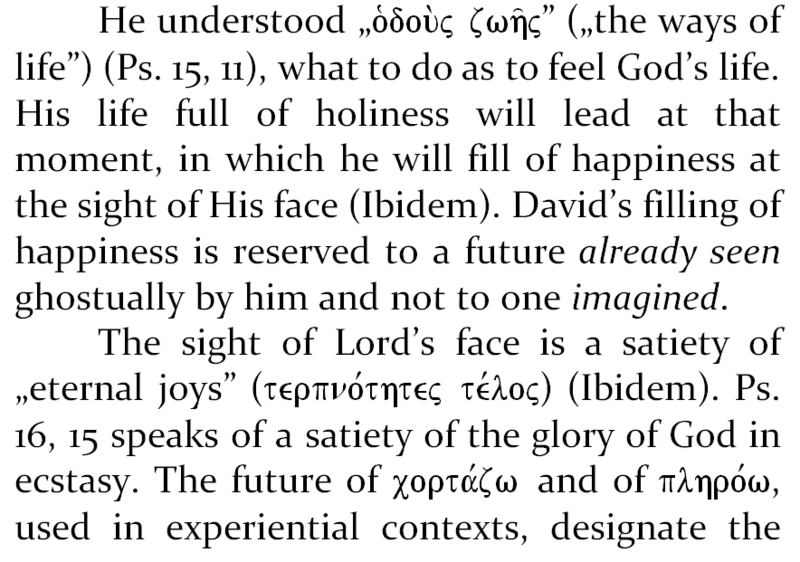 state of complete happiness of those who will see the glory of God, cf. Ps. 15, 11; 16, 15; Ps. 103, 13, 16. The Saints people will be full of divine glory, they will satisfy the longing of God seeing His glory. 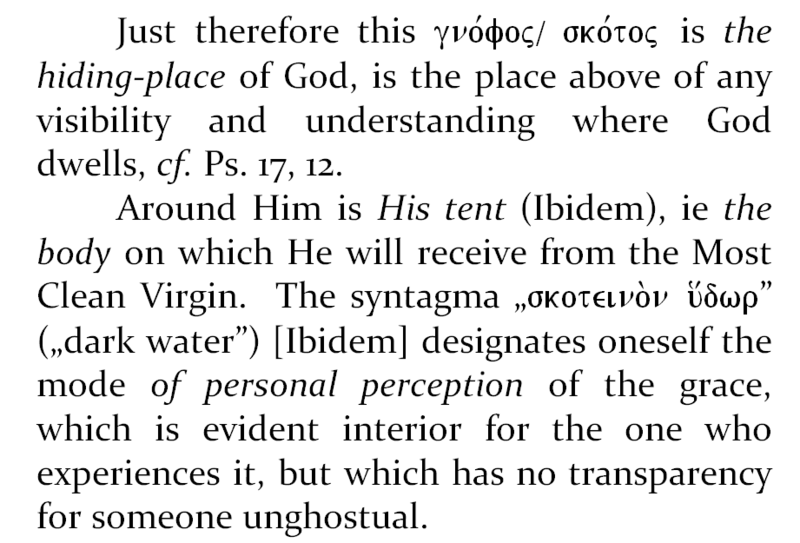 The satiation of God’s sight is ontological one and not digestive. The Saints will be filled of the light of God and will stand in His light for eternity. Just therefore the sight of the Lord’s face is a total fulfillment of longing of the Saints of to see on God and of to live with Him forever. The darkness from where comes out the Lord, His personal absolute transcendence, cannot be perceived by creatures, but His person is visible for us, only when He comes down to us as God and man. 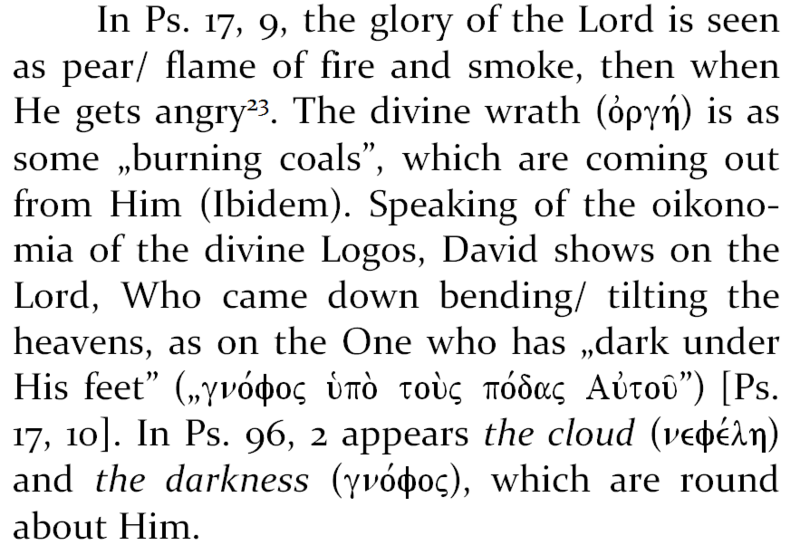 The darkness of the divine glory is the one who surrounds the being of God from eternity. 17; 91, 2 etc). God’s glory does not comprise anything untrue, but it shows us the truths of eternal realities, for that is above any human or angelic understanding. But the Saints see on God still of here, for that the beauty of God is manifested, cf. Ps. 49, 2; 62, 3; 64, 5; 75, 5; 92, 1. 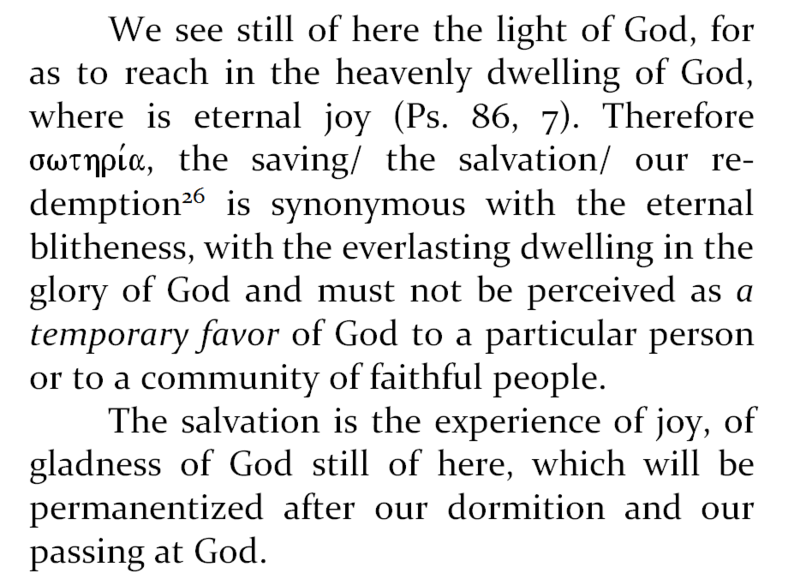 We will give all the sendings at Psalms from this section after the LXX. Therefore Saint Basil the Great wrote in his commentary at Psalms: „That one mountain is the country the one above of heaven, the country the one brilliant and bright” of His Kingdom, cf. Saint Basil the Great, Homilies at Psalms. Writings. Part I, trans., introd., notes and indices by Rev. D.[umitru] Fecioru, in col. PSB [Fathers and ecclesiastical Writers], vol. 17, Pub. IBMBOR, Bucharest, 1986, p. 207. To see and Ps. 49, 3; 96, 3, where the fire is designated as the burning before Him, the One who will come. To see and Ps. 56, 6, 12; 71, 19; 96, 6; 107, 6. The Book of the Psalms insists on the characterization of God as living God, as God who manifests the life with power before men and Which enters in the life of people as strengthening, as power, as beauty. To see: Ps. 72, 26; 83, 3; 89, 14; 96, 11; 117, 17. But perceiving on God in their intimacy, people realize that He has been from always the foundation, the strength, their fountain of life. The ghostual experience does not create a link with God from a certain age, but it conscientizes the fact, that each of us have a relation with God before we were born, from eternity, that God wanted us and supports us the existence from always. We must to remark the fact that the expression „the God of my salvation” (Ps. 17, 47; 50, 16; 67, 20; 84,5; 87, 2; 94, 1) is proper to the book of Psalms. The full attachment of God, the full love for Him is not expressed than in the terms of eternal gladness, of incessant life with Him. Our salvation is an illusion, if it means „a memorable page of history”, as in the case of the great men of culture and of science or an initiation into an esoteric group with orientation non-transcendental. Only the eternal existence, lived in complete divine happiness can be called salvation, for that it means delimitation of all that has bullied and grieved the human being in its historical condition.